The above info came from Violist of Hameln, and was edited by yours truly (contact me). The image came from the*hameln*archive. Hamel lost his memory as a child and wandered into the village of Stacatto, where he was taken in by a girl named Flute and her grandfather. One day Hamel wakes up to find that he has a horn growing out of his head! Demons, long barricaded from everywhere in the world save for Hameln, the Northern Capital, have suddenly broken through the barrier to once again war with humanity. When demons attack their town, Hamel's ability to play magical music that can manipulate his listeners comes out. 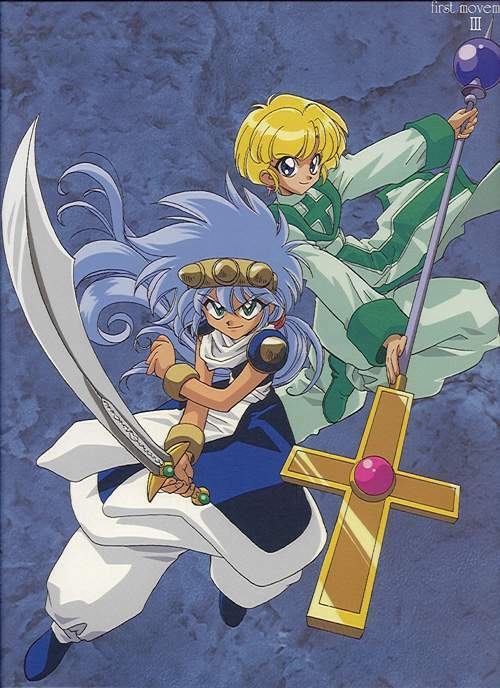 Flute and Hamel discover that they both have secrets in their pasts that make them targets for the demonic army and must flee to the human capital, Sforzando. During their journey Hamel and Flute are joined by Raiel, a magical pianist, and together fight against the kings of the demonic army, who are attempting to resurrect their imprisoned demon lord Kestra. The movie is based more heavily on the manga series, and does not exactly fit with the series. In the movie Hamel is a dominating selfish jerk, joined by Flute, Raiel and Hamel's sister Sizer. While on their journey to the Northern Capital Hamel's party find a town which has been ravaged by demons. The demons have taken the princess of the town captive, and the townspeople beg the great hero Hamel to save her. He (grudgingly) accepts and the group find themselves wandering in the old castle of Medusa. They have to defeat her- if they can avoid killing each other in the process! The above description came from Violist of Hameln, and was edited by yours truly (contact me).